Canned pumpkin is always in season to prepare this delightful waffle recipe for your next brunch. 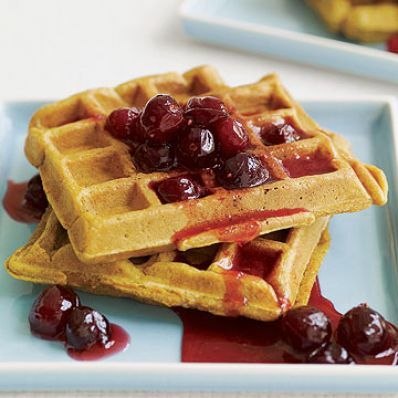 Cranberry honey sauce adds a sweet, tangy flavor to this less than 30 minute breakfast treat. 1 of 5 Preheat the oven to 250 degrees F. Place a large baking sheet in the oven. 2 of 5 Combine the flours, sugar, baking powder, pumpkin pie spice, baking soda, and salt in a large bowl; stir to mix well and set aside. 3 of 5 Combine the buttermilk, pumpkin, egg, oil, and vanilla in a medium bowl; whisk until smooth. Add the buttermilk mixture and 1/3 cup water to the flour mixture; stir until a moist batter forms. 4 of 5 Beat egg whites in a medium-size bowl with an electric mixer on high until stiff peaks form. Gently fold whites into batter. 5 of 5 Coat a waffle iron with cooking spray and preheat. Spoon about 1/3 cup of batter for each 4-inch waffle onto the hot waffle iron, spreading the batter to the edges. Cook for 3 to 4 minutes or until the steaming stops. Transfer waffles to baking sheet in oven to keep warm. Repeat procedure to make 16 waffles. Serve with Cranberry Honey. 1 of 1 Bring the honey and cranberry juice to a boil over medium heat in a medium saucepan. Add 3/4 cup of the cranberries and cook 5 minutes or until cranberries pop. Stir in the remaining 1/4 cup cranberries. Remove from heat and let stand 5 minutes before serving. Makes about 1 cup.